UPDATE: We are accepting applications for the 2016 edition of our online poetry course. Please visit our submittable page to view the details and apply. Last date for applications is 24th January 2016. It’s our job to work with new writers, and we realised a few years into the endeavour that editing alone would not be enough if we really wanted to act as an incubator for good writing from South Asia. However, we did not believe in rolling out courses production-line style, with inexperienced instructors and little thought for real capacity building, and so we decided to proceed slowly, building our own capacity first and formulating a solid premise and vision for a workshop programme. Desi Writers’ Lounge (DWL) took its first steps into the writing workshop arena discretely in Fall 2012 by offering an online fiction workshop to its forum members. The workshop, led by one of our editors, Noorulain Noor, focused heavily on helping participants to break their writer’s block, setting weekly writing assignments and peer reviewing them within the group. This was followed by an online poetry workshop, also offered only to DWLers and led by Noor. Our first online poetry course for the public saw fruition in August 2014. 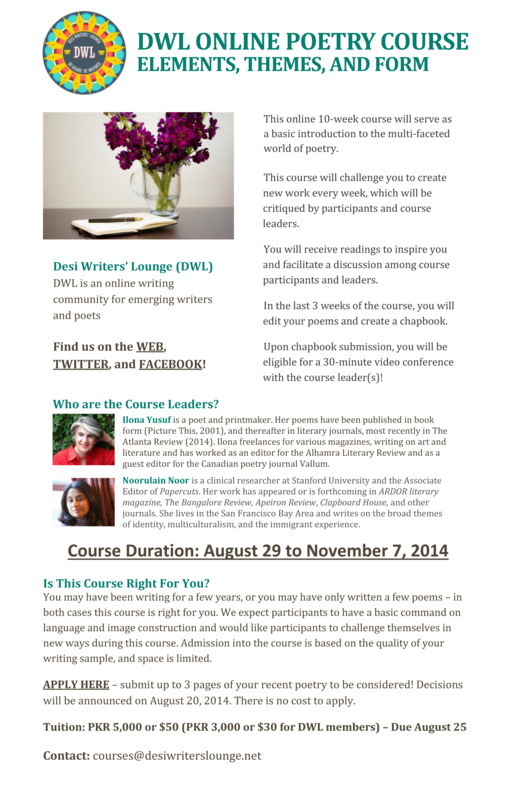 Titled DWL Poetry Course – Elements, Themes and Form, the course was led by three instructors: Noorulain Noor, Ilona Yusuf and Zakia Rubab Khwaja. 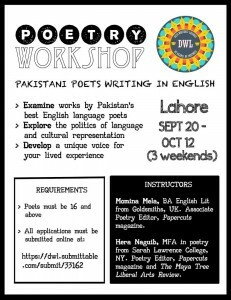 In September 2014, Papercuts poetry editors Hera Naguib and Momina Mela conducted a public workshop in Lahore called Pakistani Poets Writing in English. The three-weekend workshop was designed keeping in mind the challenges of cultural representation and language faced by young poets. 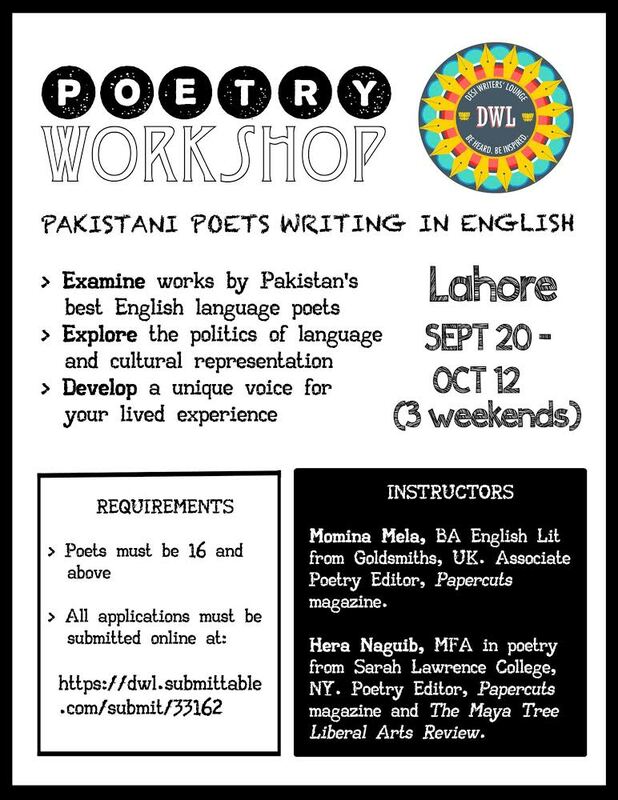 We will continue to offer workshops for poetry and fiction, depending on the availability of appropriate, qualified instructors. All workshops will aim to address specific areas that South Asian writers and poets need to focus on in order to grow. 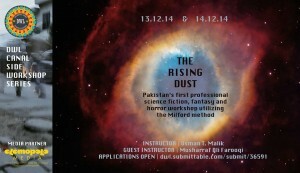 DWL conducted two one-day speculative fiction workshops titled “The Rising Dust” in Lahore on December 13 and 14, 2014, with instructor Usman T. Malik. We selected 11 participants overall to attend the workshops. Malik and the participants critiqued stories submitted by the participants prior to the workshop sessions. They also read and discussed three stories by spec-fic writers Vandana Singh, Ted Chiang and Algernon Blackwood. 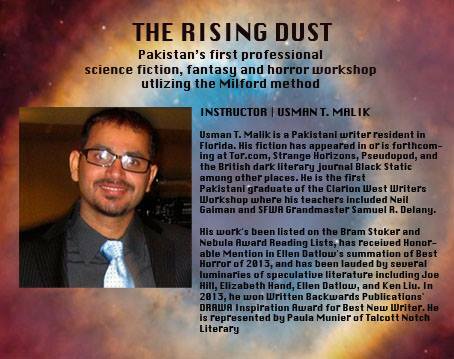 Pakistani novelist Musharraf Ali Farooqi delivered a guest lecture on both days of the workshop in which he spoke with the participants about the use of indigenous myths, cultures and traditions in spec-fic writing. DWL also had the honour of having writer Jeff VanderMeer and editor Ann VanderMeer, and literary agent Jennie Goloboy chat with the participants via Skype from the US on the first and second day respectively. 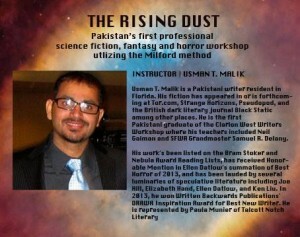 Malik also delivered two public talks on fiction over the same weekend. He talked about the business side of speculative fiction writing and the art of storytelling. Read More: Stories, photos and videos from The Rising Dust 2014 on the DWL Blog.